More and more homeowners are starting to think of the kitchen as a room for experimentation – not just the culinary kind, we’re talking about interior design experiments. The best design reaches beyond aesthetics, facilitating a dynamic range of practical tasks and social occasions. The result is not just a look, but also a function. Bringing the family together, putting food on the table, welcoming the guests – innovative kitchen design plays a crucial part in each of these functions. A perfect balance of beauty and function rests on an interplay of light, texture, colour and form. These elements, although separate, must be considered as one whole entity. The morning sun, as it seeps through closed curtains, breathes new life into every material and colour it touches, changing the atmosphere of your kitchen as the day ticks along. The most understated features, like spice racks and drawer handles, are elevated by the surrounding elements of your design, often showing aesthetic interest in their own right. It is through this that worktops, as a focal point of the kitchen, are able to express the whole design story of the room through colour, shape, contrast and material. Indeed, when designing a kitchen from scratch, many start by choosing the worktop material and working backwards from there with designs that complement the qualities of luxury kitchen worktops. Whether you’ll be taking this approach or not, choosing the best material for them is one of the most important decisions in the kitchen design process. So, in this edition of the Extreme Journal, we’ll be looking at some of the most interesting materials that you should consider. Remember, we’re looking at beauty and function; for truly luxury kitchen worktops, durability and versatility must be taken into account. When it comes to worktops with a natural appeal, granite is the matériau classique of luxury design. Yes, before marble, great luxury buildings – think the interior of the Great Pyramid of Giza – were bedecked in granite thanks to its unique colouration, beautiful natural patterns and ultra-durable nature. Despite this, the use of granite in worktops is actually a relatively new fashion, only being seen as a cutting edge ‘object of desire’ in the kitchen from the late 1980s. Granite worktops are popular for a reason. Their strong and hard wearing qualities make them one of the most durable materials available. Nature always makes a statement, and granite brings the elements into your home: the stone is cut in its natural state and then heavily polished before use in the home, preserving a distinctly earthy charm. Available in a range of colours and textures, granite is versatile enough to suit both modern and traditional interior. Its natural qualities also mean that it’s resistant to scorches and scratches. These hard-wearing natural worktops only need resealing every ten years. Whether ash or beech, oak or walnut, hardwood never fails to give your kitchen a natural feel. With each piece of timber displaying a different grain – knots and saplines abound – hardwood worktops have the potential to have an amazing effect on any room. Indeed, depending on the grade of the wood, these diverse materials can be suited to kitchens both rustic and more contemporary. Either way, the play of colours and textures in these luxury kitchen worktops helps bring a touch of warmth to the room. Most hardwoods (especially oak) are wonderfully durable and sustainable, lasting years, decades, and often lifetimes. Of course, you should expect the wood to gather a couple of scratches and light stains in that amount of time. Much like a worn leather jacket, these nicks and areas of slight discolouration add the kind of character to your kitchen that money can’t buy. A worn worktop of luxury wood tells a story about the worktop, kitchen and family who cook there without a word needing to be said. 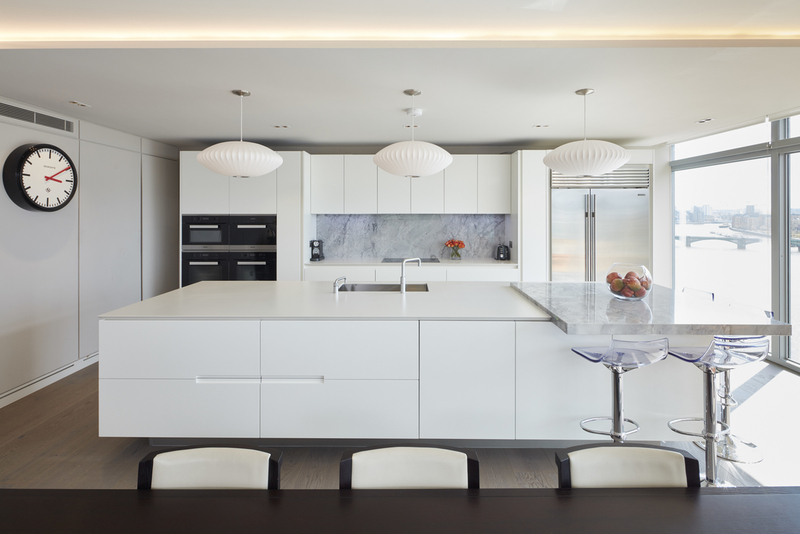 For truly luxurious kitchen worktops, many people seek out marble. Perfectly fitting into the Athenian Acropolis or Roman Pantheon as easily as the contemporary home, marble exudes centuries of luxury. With a distinctly creamy texture, exquisitely soft and cool feel, along with a myriad of unique details, marble worktops are like pieces of art in themselves (it makes sense that Italian Carrara marble was used so frequently by great renaissance artists). The thermal density of marble allows it to resist heat, making it easier to keep dough cool when you’re working on fresh pastries – perfect for budding pâtissiers – or simply to cool yourself on during a warm day! While beautiful, it’s not always practical to have marble worktops in your kitchen. Unlike granite, the durability just isn’t there; marble is soft and porous which means that it is more prone to damages such as scratches and stains. Many people adore how marble ages over time and feel it adds character, with each mark or stain telling a story of the wonderful moments and experiences that have taken place in the room. Whilst this romantic view can sound quite appealing and is embraced by many – particularly in countries such as Italy – some of us wish for our kitchen to look as perfect in 10 years as it did when it was first installed. Glass worktops are the perfect addition to a contemporary kitchen, combining modern looks with sustainable appeal and dazzling ‘art deco’ edge. Available in a wide variety of colours, glass worktops can have a transformative effect in the kitchen, giving the room a sense of space and offering the opportunity to play around with light – there is even the option to light glass worktops from below, causing an almost psychedelic effect. Practically speaking, although often prone to scratches, glass is resistant to almost all damage and marks from stains, heat and water. Glass is also an environmentally friendly option, with almost no environmental impact. You may just have to be extra careful not to chip the surface; unlike marble or granite, glass won’t be so forgiving if heavy objects find themselves colliding with it. It’d also do you well to keep some polish at the ready as you’ll certainly need a way to deal with any fingerprints. Walk into any professional kitchen and you’re likely to find it clad with stainless steel worktops. Easy to clean, simple to use, hard to damage, and built to last, stainless steel is the go-to choice for kitchens where the cooking gets intense. 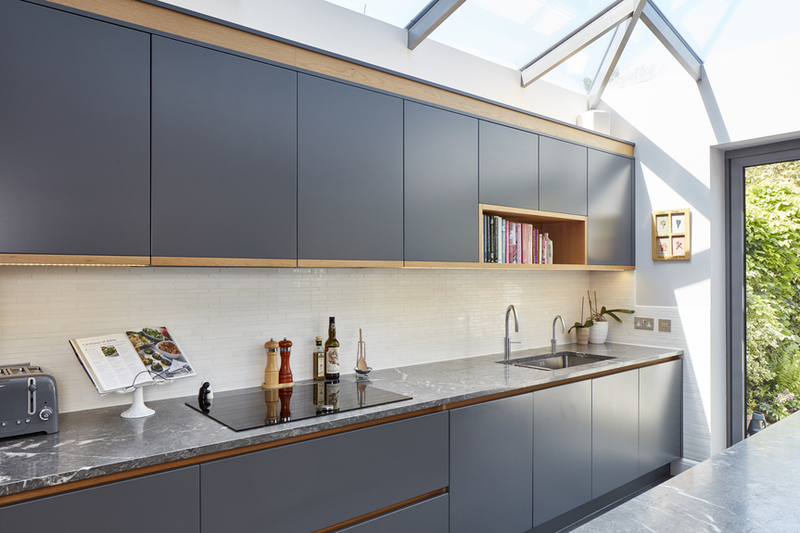 The practical benefits don’t stop there – stainless steel worktops are also gifted with antibacterial properties and resistance to heat (allowing you to place boiling pans directly onto the surface without fear of causing any scorching damage). Aesthetically, while they may have been designed to have no frills in more professional contexts, they look great in homes that embrace a more rugged, industrial aesthetic. It may be too clinical for some, but the smooth and glossy simplicity of a stainless steel worktop fits perfectly into rooms with plenty of metallic accents. Paired with a sharp Wolf range cooker, minimalist decor and a chef with a fiery passion for restaurant-quality cooking, nothing beats stainless steel. Not the first thought of many when it comes to luxury kitchen worktops, but concrete is the epitome of industrial design. Recalling the brutalist structures of Le Corbusier, as well as the harsh yet endearing qualities of urban environments, concrete worktops can give the kitchen an eye-catching, stark and minimal feel. Many still see concrete as a material best left relegated to the construction site, but when balanced out with wooden accents and warm lighting, concrete can be beautiful – especially fitting in more ‘experimental’ interiors. While it needs sealing to prevent absorption, concrete is incredibly durable and highly resistant to damage. Plus, any damage that does occur simply adds to the weathered effect properties of the material. If you think you’re brave enough, why not give your kitchen a concrete centrepiece? Minimalists will love ceramic worktops. The appearance is silky smooth (either matte or gloss), with no embellishments besides the gorgeous natural patterns displayed across the surface necessary. Gaining popularity in modern homes over the last few years, ceramic is available in several colours, textures, and styles – but the overall look is always clean and streamlined, complementing interiors that shun clutter and embrace simplicity. It’s certainly a more luxurious option, but also one wherein the phrase “you get what you pay for” rings true. Highly durable, resistant to heat and water, and low on the maintenance front, ceramic defines luxury kitchen worktops. Incredibly beautiful and unlikely to present you with any practical obstacles, it’s a highly sought after worktop material. Ceramic can also make a great alternative to natural stone. To achieve a natural appearance, a pattern inspired by stone is printed onto the ceramic. One of the main differences between high-quality and low-quality ceramics is the print quality of this pattern. It is always important to seek out the best, as high-quality ceramics use more advanced printers to achieve more dots of ink per inch than a lower quality ceramic. The more dots of ink are printed per inch, the higher quality the image will be. 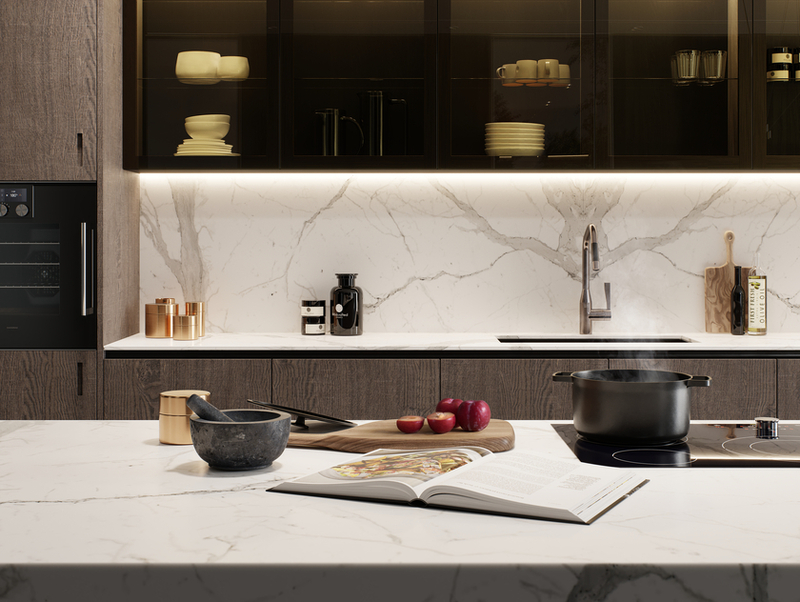 The best ceramics can easily be mistaken for real stone – take the ceramic featured in one of our recent Extreme kitchen designs, shown in the below image. 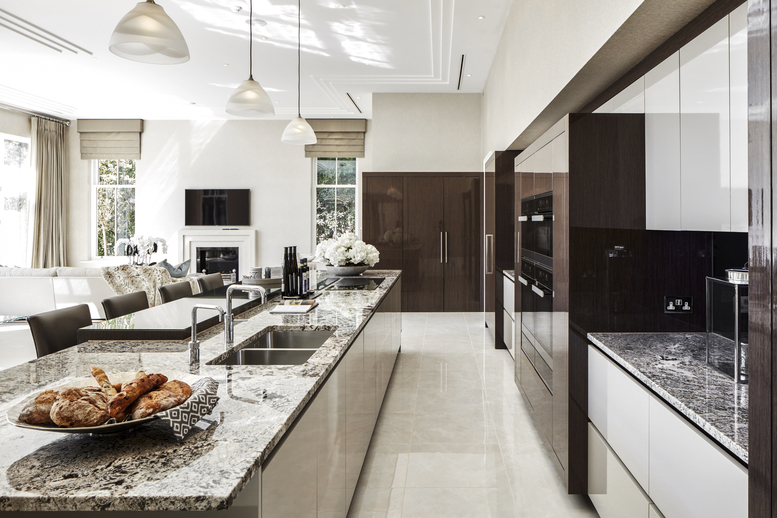 If you’re still unsure as to what kind of worktop you need, visit one of our studios and collaborate with an Extreme designer to discover the luxury kitchen worktops of your dreams.